Waking up and realizing I was actually in Cuba was still surreal even after more than 24 hours because the country was so different than the United States. The day started with an amazing breakfast at our residencia, which included eggs, various fruits, muffins, coffee, and juice. The breakfast was way better than what I would eat for breakfast at home any day. After this wonderful meal, we departed for a walking tour of Old Havana. While driving into Old Havana I noticed that the majority of the buildings on the way were very old and were deteriorating or had already broken down. I found this to be very interesting because I do not see this too often in Massachusetts, at least not around my area. 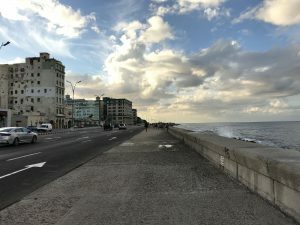 Also on the way to the city we caught a quick glimpse of El Malecon, the sea wall that runs along the coast of Havana. At El Malecon waves can be seen crashing into the wall and if the waves are large enough they crash over the wall and into the street which would then close the street to traffic. When we saw it on this day the street was closed and the waves were massive. 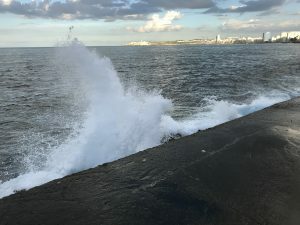 Seeing El Malecon was captivating to me because I enjoy seeing different things that involve the ocean and El Malecon is so unique that I could spend days there just watching the waves crash against the wall. This is El Malecon and a wave crashing into the wall. Once we arrived in Old Havana we entered Plaza de Armas, which was the first plaza to be laid out in the city. The plaza was surrounded with old but beautiful buildings including an old spanish fortress. The older buildings made it feel like we had traveled back in time and seeing the city in the past since none of the building have been changed old restored. While in this plaza multiple people came up to our group and tried to sell different things including a man who drew a picture of me and another student and told us they were for us to remember Cuba. 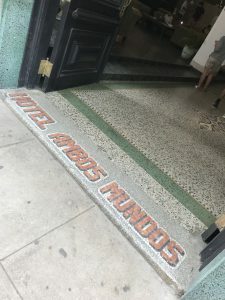 After seeing this plaza we made our way to see Hotel Ambos Mundos, which is where Ernest Hemingway would stay before owning a home in the country. 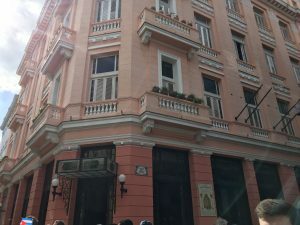 We could not enter this hotel due to the United States’ regulations with American travelers in Cuba, so we looked at it from the outside. The hotel is a very brightly colored pink building with white trimmed windows and amazing architecture. From outside, Ernest Hemingway’s room was pointed out to us by our guide, Ana. 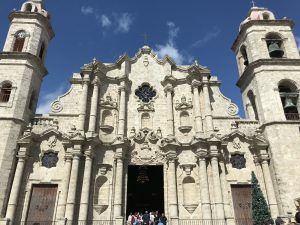 We then walked through other plazas in Old Havana and took in the breathtaking scenery and architecture including, churches, boats, hotels, and restaurants. One of the churches we saw was La Catedral de la Virgen María de la Concepción Inmaculada de La Habana, which is a Roman Catholic church. Inside there is a statue of Pope John Paul II, or Juan Pablo, and Saint Christopher who is the patron saint of Latin traditions. The facade of the church was beautiful with two bell towers and a very elaborate design, which I found very aesthetically pleasing. 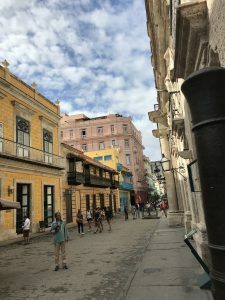 Ana told us numerous fascinating facts and stories about old Havana as it pertained to the buildings we saw in each plaza and those points of interest we encountered while walking around. While walking around Old Havana I noticed these weird tunnel looking entrances into the ground. Ana went on to tell us that these strange holes in the ground were the way that the city transported water in the city’s early years. After our walking tour we were able to get lunch, and some other students and I decided to go to a restaurant that served Italian food like pizza, pasta and other dishes. It was interesting to see how Italian food was from another country. I thought the pizza I got was decent but not as good as pizza from the United States. Old Havana was one of the most beautiful cities I have ever seen with its vibrant colors and fascinating architecture. 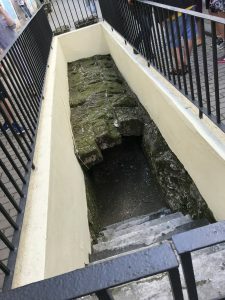 The history behind the city is also very interesting and full of many facts people may not know of. These together make the city of Old Havana one of the most fascinating places to see and to experience. This entry was posted in Uncategorized by zachary_cash@student.uml.edu. Bookmark the permalink.